Significant changes have been made to infantry and vehicle balance. These changes are listed in the last sections of the patch notes and are over 10,000 words. Over the next few weeks you may come across some snowmen scattered across the frozen wasteland of Esamir. These jolly and harmless fellows can be blown up for a nice chunk of XP, and, if you can light up enough of them you may earn a special reward. Also, keep your eye out for a rare blinged out Golden Snowman who gives a very exclusive reward. If you see one, make sure you get it before your squadmates do! Nanite Systems has been hard at work on a new pistol. Get a silver medal with it and you will unlock a special title. In addition to new holiday camos and decals, from the 18th of December through the 1st of January we will be having some huge sales in game. Each day during those two weeks a new category in the marketplace (such as “shotguns” or “helmets”) will be on sale for 50% off. In addition all Items of the Day items will be 99SC regardless of their original cost, and Members Only Item of the Day items will be 1SC, so make sure you log in every day and don’t miss out on anything good! Make sure to give your enemies the gift of C4 this holiday season! Lowered the cert point cost of some optics on starting weapons to let new characters customize their weapon earlier. A small group of accounts have had items removed that were incorrectly purchased without subtracting Station Cash. This should alleviate situations where pilots and others are downed more than one region away from a friendly territory and are stuck with no good spawn options. This change will offer the nearest small outpost and nearest large outpost in addition to the nearest major facility that is already available. This should allow those players to either join the nearest front or fall back to spawn another vehicle at a larger facility. Please note that the distance is by lattice-links, not as the crow flies. 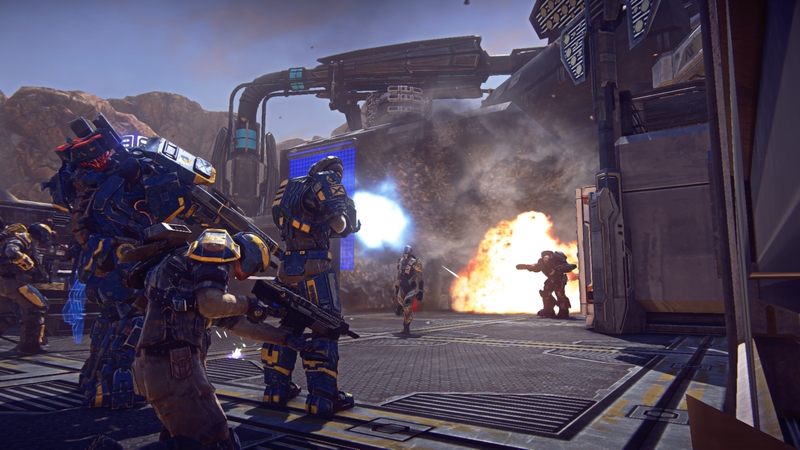 You can now deploy at any warpgate regardless of your current continent. Functionality for a squad leader to mark a cap point has been added. This will add arrows to the objective indicator on the HUD that your squadmates can see. Hold the spot button down (q by default) to bring up the quick menu while targeting a capture point to set the indicator. Freyr Amp Station update. We’ve added multiple cap points to the Freyr Amp Station. Each cap point is tied to a nearby spawn room. By reducing the reliance on Sunderers for spawning, this should facilitate some fierce infantry battles at Freyr. The Harasser is performing too strongly on the battlefield. It’s very fast, has a good amount of armor, a good selection of weapons, and can even repair on the run. We’re going to make changes that require the Harasser to use its speed to get closer to targets and create more risk versus reward. So, the range of most Harasser weapon variants is being lowered. In addition, anti-personnel style vehicle weapons are receiving buffs against light-armor. These weapons also generally have a higher RPM and faster projectiles so they are more capable of hitting a high speed target. Details on specific weapon changes are listed farther below in the individual weapons section. With current Turbo values it is too easy to use Turbo to easily get into and out of combat. So, we are lowering the regeneration and increasing the amount of fuel burned per second. This should make the choice on when to use the turbo more important and not an always available option. Being able to repair on the move is too strong of an advantage, but we do like it as an option. So the effectiveness of repairs made from the rumble seat has been reduced to 30%. We think at this rate there will still be times where repairs from the rumble seat will be useful, but not while in the middle of combat. Composite Armor is also providing too much of a benefit and overshadows other defense slot items. We’re reducing the armor bonus granted per rank from 5/10/15/20% to 2/4/6/8%. This will on average cause the Harasser to take ½ less tank rounds to destroy. We also removed the C-4 resistance that composite armor grants, since it is already pretty difficult to hit a moving Harasser with them. Based on the results of this change, there might be further modifications to composite armor, stock armor values, or other defense slot items. The only adjustment to stock armor and resistance values is reducing effectiveness against “light anti-tank weapons”. We want these weapons to be part of a group of weapons that are strong against the Harasser. Harasser resistance to “Light anti-tank” damage reduced from 35% to 0%. This gives the Fury, Zepher and Bulldog increased damage to the stock Harasser. The Lightning C75 Viper was also using this damage type but that has been changed to tank shells (details further down). We are adjusting the M20 Basilisk, M40 Fury, P525 Marauder, C85 Canister and Proton II PPA to be stronger light armor counters. Light Armor includes: Flash, Harasser, and ESF. In addition, all Harasser variants will have either its range or damage reduced. Flash variants will be adjusted to match the Harasser variants. And finally, we are working towards bringing the weapons more in line with each other. The M12 doesn’t get equipped very often so we want to further define this weapon from the basilisk as a superior infantry killer. We are increasing damage at close ranges and pushing out the minimum damage range. In addition, we are adding headshot and legshot multipliers. Finally, we are making adjustments to the cone of fire making it even more accurate in bursts, but a bit less accurate when held down. This should make the M12 Kobalt stand out more from other weapons and perform well at all ranges. As one of the changes to promote the Harasser getting closer, the Harasser & Flash variants of the weapon have their damage fall off occur sooner. The Basilisk performs decent, but we feel there is some room for improvement, especially just how it feels when firing it. The below changes should be an overall improvement for the Basilisk especially at close range and against vehicles. It is receiving a rate of fire buff so that using the gun feels better and it feels like it hits more often. The CoF changes are intended to offset some of its infantry killing capability, especially with its rate of fire increase. As one of the changes to promote the Harasser getting closer, the Harasser & Flash variants of the weapon have their damage fall off occur sooner. Being the air borne version of the Basilisk, we made some similar adjustments. The fall off for this variant is being adjusted to be to better overlap with ESF fall off damage. For now, we are just defining a difference for the Harasser version. The direct hit damage is increasing for the Sunderer variant. This weapon has been renamed so there is less confusion with the enforcer ML and it is receiving lots of adjustments to bring it more in line compared to the Marauder and PPA. While it lacks splash damage it has the highest potential damage output, is receiving headshot multipliers, has the quickest projectile, receiving additional ammo per magazine, receiving additional pellets per shot, and the pellet spread should allow for some slop in aiming. As one of the changes to promote the Harasser getting closer, the Harasser variant of this weapon has its damage fall off occur sooner. This resist type does no damage to heavy armor, but does good damage to light armor. As part of the light armor changes we want to increase the Marauders effectiveness against light armor. For that, we are going to be increasing its projectile speed on the tank version and it is now on a new damage type that will do more damage against light armor, but no damage to heavy armor. Against infantry, the Marauder outperforms most weapons, so we are going to tone its anti-personnel capabilities down. We are lowering the blast damage and matching the blast size ranges with the PPA. As one of the changes to promote the Harasser getting closer, the Harasser variant of this weapon is not receiving the projectile speed increase, and will do less damage. As part of the light armor changes we want to increase the PPAs effectiveness against light armor. For this, we are placing it on a new damage type that does extra damage to light armor, but no damage to heavy armor. Otherwise, the Proton II PPA is close to where we would like. We’re going to bring in the fall off damage ranges to better match the Basilisk and Canister, and reduce the inner blast damage radius. We are also experimenting with increasing its projectile size to see if that provides any noticeable benefit. As one of the changes to promote the Harasser getting closer, the Harasser variant of this weapon has its fall off damage occur sooner. The Fury performs well, but we want the fury to be a more distinct choice compared to other similar options. We’re going to do this by allowing increasing its direct hit damage and allowing that to do damage to heavy armor. The damage it can do to heavy armor will be higher than what it could do previously. Its blast radius will be brought to match the PPA and Marauder, but we will also increase its magazine size. As one of the changes to promote the Harasser getting closer to targets, the Harasser and Flash variant is adjusted to do less direct damage than the tank version. We are making adjustments on these weapons based on data to bring them more in line with each other (details next to each weapon below). In addition we want to make them less effective against infantry. To do that we are bringing the damage of these weapons down by approximately 66%. This will allow us to make flak armor more consistent and more effective against them. Vehicle resistances are being adjusted to make the damage against them the same. The blast has been reduced to make it less effective against infantry (direct hits can still one shot non flak armor infantry). We are also adding some new acceleration mechanics to the weapon. We expect this to be a slight decrease in its effectiveness at sniping infantry and range. The harasser version has been tuned to do less damage than the tank version. The Enforcer slightly underperforms compared to the Halberd, Vulcan and Saron. So will be a damage increase against other vehicles (by not lowering it by 66%). We are also increasing its splash damage to be in line with the other weapons. Finally, we are also applying the new projectile acceleration mechanics to it. We expect this to be a slight decrease in its effectiveness at sniping infantry and range. The harasser version has been tuned to do less damage than the tank version. The Saron is pretty close to where we like it. For now, the only change we are doing is adjusting the harasser version. It will require one more splash hit to kill if hitting with only inner splash damage. Lightning resistance to Armor Piercing Bullets increased: Adding about 1 second to the TTK on average. Between the Halberd, Enforcer and Saron, the Vulcan is the highest performing, so in addition with lowering its damage against infantry, we are bringing the damage range in. The previous damage ranges were pushed far beyond what our data shows as the range the weapon is actually used in. As one of the changes to promote the Harasser getting closer, the Harasser version now matches the damage values of the tank version and instead the fall off damage is brought in closer. Tank cannon damage and resistance is being adjusted in order to keep damage numbers more consistent. Time to kill should remain the same with AP and HEAT in most cases. We think High Explosive rounds are performing too poorly when used against other tanks so they are getting a direct damage increase. Phalanx Turrets and Facility Terminals are receiving increased resistance to tank shells. A Phalanx Turret is now equivalent to a side hit against a Magrider or Prowler. A terminal in most cases will require two tank rounds to destroy. We are lowering the damage they can do versus infantry and heavy armor. We want them to be excellent against air and light armor and they are just too high on the list of things killing infantry and armor. There are other weapons to pick on the ESF for those targets and we want to drive that distinction more. So we are lowering the base damage of nose cannons and adjusting vehicle resistances. Against most vehicles, the TTK will be the same. Fall off damage is also being adjusted with a few goals in mind. It goes well with our above goal and over time, we will be adjusting other weapons like the Walker to better overlap with these new damage ranges, creating a better dynamic for ESF engagement ranges. Additionally, it provides further distinction between the default nose cannons and the rotary nose cannons. Finally, we will be making some adjustments based on data gathered since the cannons were re-tuned several updates ago. Reload speeds are being adjusted to bring damage over time of each weapon closer to each other. This includes making the rotary damage over time closer to the default nose cannons. This removes an advantage the rotary has against high health targets such as MBTs, Galaxies and Liberators. We also found the Mosquito nose cannons in general were outperforming, so we are lowering their magazine size advantage. As mentioned above, for each empire, damage is being lowered against infantry and the fall off damage range is being brought in. Reload speeds are being slightly tweaked to bring the damage over time closer together. The Reavers minimum damage is not lowered as much as the other empires. The Mosquito is outperforming the other empires so we are lowering its magazine size advantage. As mentioned above, for each empire damage is being lowered against infantry. The fall off damage range was brought in. We are adjusting the reload speeds to better match damage over time between these weapons and the default nose cannons. The Mosquito is outperforming the other rotary cannons so we are lowering its magazine size advantage. Weapon could use a small buff. We are going to increase its effectiveness against vehicles a bit by changing its damage type. The tank adjustments noted above still cause the damage value to decrease, so we are also increasing its blast damage to ensure it can still 1 hit kill a non flak armor target. Sunderer Resistance versus type 4 damage (heavy machine gun) increased from 70% to 75%. Mostly as a response to the Basilisk rate of fire change, but looking at data, the Sunderer is a bit too vulnerable to heavy machine gun damage and could the increase in resistance. LMGs have been performing too well at hip-fire when compared to the other weapon types. This coupled with their higher than average ammunition capacity has caused them to outclass other weapon types in those other weapon’s intended roles. We’ve done a global reduction to hip fire accuracy across all LMGs to make them more LMG-like. Weapons with 0.75x aim move speeds have been adjusted so that they have clearer tradeoffs for that move speed bonus. This generally means more recoil to better match their role as close-quarter weapons, and in some cases longer reloads. Assault rifles with hip-fire accuracy bonuses have a little too much hip range when compared to the standard rifles. Hip-fire accuracy on these weapons has been reduced, though they still have higher accuracy than the standard assault rifles. Carbines have had their minimum damage range brought in by 5 meters. This better matches the scale of our facilities and the carbines intended role as a closer range weapon when compared to LMGs and Assault Rifles. Laser sight attachment modifiers have been reduced so that they will no longer cause a weapon to have better accuracy than a weapon type that is two or more accuracy tiers down. For example, an LMG with an advanced laser sight will no longer give that LMG SMG-level hip accuracy (Yes, that was happening before). This weapon has received the standard assault rifle hip-fire reduction. Recoil has also been increased to better match its rate of fire. The Reaper is getting a magazine size increase to even out its kill potential compared to other assault rifles. It is also receiving accuracy buffs so that movement isn’t as penalizing. This weapon has been growing in popularity after our last round of moving accuracy buffs. We’re taking those same buffs and applying them to the stationary states. This weapon is receiving the standard 0.75x hip-fire and recoil adjustments. Like the Reaper DMR, we’re improving both bullets per magazine and overall accuracy. This weapon will now output more damage over time compared to before even though the reload time is being lengthened. Recalculated the number of NC killed by C4’ing themselves. The new total is 591,432,0499. Short reload is now faster to better match its magazine size and rate of fire. Both full-auto recoil drift and recoil recovery have been improved. Improving damage at range and long reload. The damage improvement increases this weapon’s performance at range against targets with nanoweave armor equipped. Improving non-moving accuracy and recoil so that the weapon is more accurate both when standing still and while moving when compared to the base Cycler. Min horizontal reduced from 0.225 to 0.2. Max remains the same at 0.225. Long reload improved to better match magazine size. This weapon is performing a little too well at range when compared to the other pistols range. It only needs a slight adjustment so more recoil drift is being added in. Reduced maximum recoil angle. Makes initial burst more accurate and predictable, and overall recoil more consistent. Recoil is being increased. This weapon previously had too little recoil for its rate of fire. Maximum horizontal recoil increased from 0.25 to 0.275. Minimum horizontal recoil remains the same at 0.25. All VS LMGs now match the LMG standard of having a 0.2 crouch move COF and a 0.4 stand-move LMG COF. The VS carbines and assault rifles retain their high moving accuracy because it offsets them having lower magazine sizes and a lower than average rate of fire, which are traits that the VS LMGs don’t share. Increasing vertical recoil so that it better matches the weapon’s rate of fire. This weapon previously had a recoil value that was the standard for most 650 RPM LMGs. Lengthening reloads to match 0.75x move speed weapon standard. This weapon is not receiving the 0.75x moving accuracy penalty because of its lower rate of fire. This vertical recoil reduction gives the weapon the same full-auto recoil as the other weapon in its rate of fire class, just in a slightly different pattern. Tweaked the code that unlocks the secrets of Vanu. It is now 593-754-8133. Small reduction to reload speeds to match the damage output of other weapons in its class. Small increase to accuracy so to better offset its lower rate of fire. The below damage change is as overall improvement to the Eridani’s damage curve. Improved angle so initial burst is more accurate (no shots land on right side) and overall recoil is more controllable. Same burst improvement as above NS-11 weapons. This weapon is also receiving a small increase to horizontal recoil drift because it was incorrectly set too low before. It now matches the other NS full-auto weapons. All sniper rifles have been adjusted to have better defined 1-shot headshot kill ranges. Reload speeds, damage, and other stats have been adjusted to match. All launchers have been reduced in damage so that they better interact with flak armor. The resists on the vehicle side have been modified to match, so all launchers will still be doing the same damage against vehicles as before, with the exception of the Annihilator which got a damage increase. The Annihilator is getting a damage increase because it already had two downsides, it lacks lock-free fire and it has a longer lock time. We’re removing the third downside. Close range lock-on times are now faster to better fit the risk/reward gameplay between infantry and vehicles. Rocket acceleration has increased to make hitting moving targets easier. Rocket speeds and gravity have been adjusted to match. Max aimed accuracy now matches the majority of other weapons in the game at 3.0, increased from 2.0. This has no impact on most movement states. The exception is firing while jumping, which will be less accurate now. Reload speed is now faster at 4.7 seconds, down from 5.2 seconds. Projectile lifespan was reduced from 15 to 10 seconds. This drops its max range to match the AV turret’s render distance. Max damage reduced from 1000 at 0.5 meters to 500 at 0.35 meters. Gravity value of 2 added. This only applies if the rocket is no longer controlled. Damage and accuracy values have been adjusted. The previous values were too strong for a weapon that has no resource cost limiter. The biggest change here is that an indirect hit will no longer kill a full health target, only direct hits will. Note: This is a larger change then it sounds like. We fixed a bug that was causing the previous gravity value to not apply correctly. All MAX AV weapons except the VS Vortex have had their damage infantry reduced. All MAX AV weapons now originate their projectile at the eye, making them all more accurate. Counted the number of hairs on Higby’s head. The total was 599,687,0498. The short reload is now longer at 1.8 seconds, from 1.5 seconds. This offsets the increased damage against infantry. Fixed a bug that caused charge level 1 to be weaker against Prowlers (and Magriders). Damage is now consistent across all tanks. Infantry hitboxes have had small adjustments. The head hitbox has been adjusted to fix a bug that was causing upper chest shots to count as head shots in certain movement states. Actual headshots should be unchanged. *Unearned* headshots will no longer happen. Hitboxes now better match the player’s actual geometry. Leg hitboxes have received the biggest change. The rest of the player’s body is less noticeable. We reduced the length of projectile impact audio on infantry. It will be easier to tell if multiple bullets are hitting now, instead of multiple bullets blending together to sound like one impact. This ability has proven to be an all-around upgrade compared to the baseline MAX. It is receiving an overhaul to make it more of a situational ability compared to before. In addition, both the speed and damage increases are being reduced so that the ability better fits into the MAX vs. infantry balance.